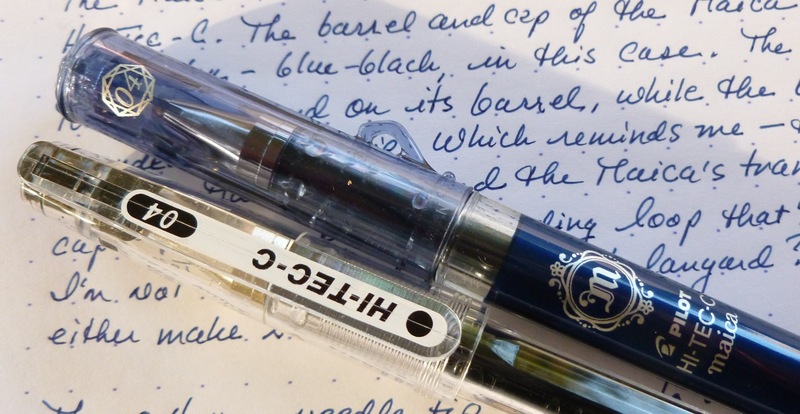 The fine folks at jstationery.com sent along the Pilot Hi-Tec-C Maica for review (a fun surprise!). When I opened the package and took a look at the branding, I said (and I quote), “Oooooo, nice!” I have plenty of the basic Hi-Tec-Cs floating around, but not a single Maica. A a blue-black Maica, no less! How did they know that I’m on a blue-black kick lately? Because I’m so familiar with the normal (basic) Hi-Tec-C (who isn’t?! ), I was interested in comparing the Maica to that base model, and here’s what I found. 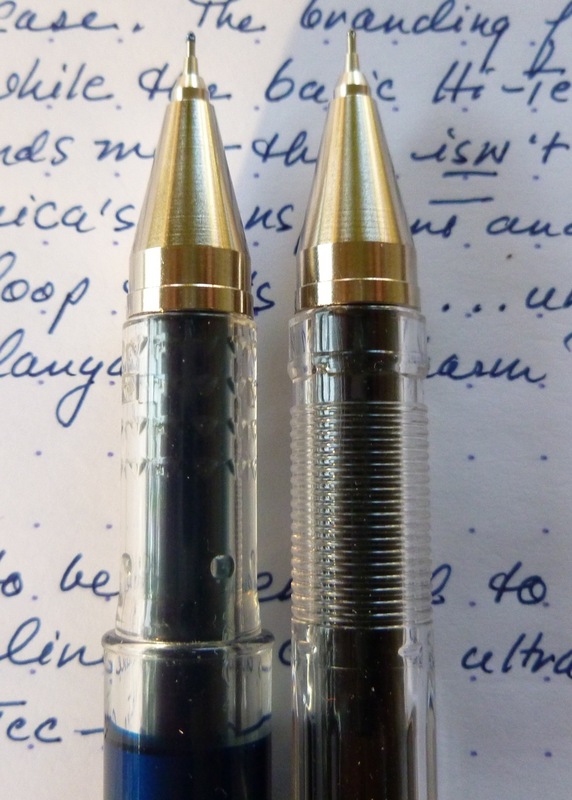 As you can see in the side-by-side comparison, the Maica pen body is longer, just a bit thicker, and I can tell you that it’s slightly heavier. Though still plastic, the Maica feels more substantial. 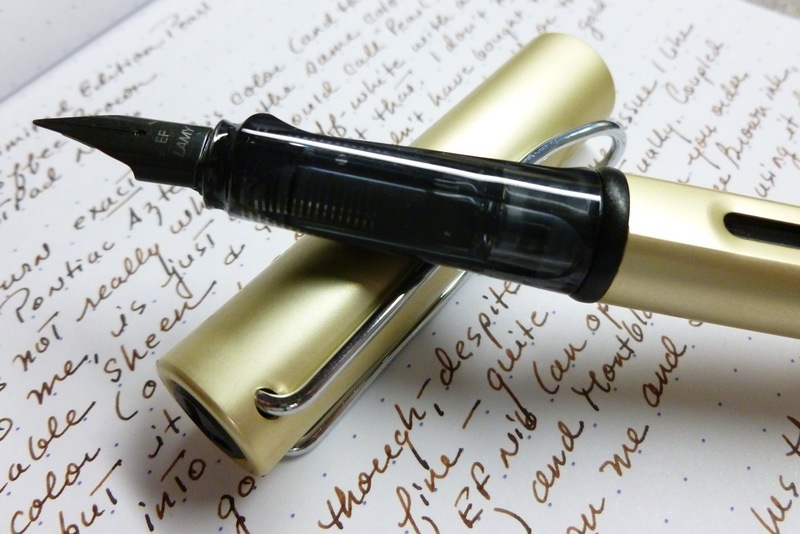 Whereas the basic model is clear plastic and faceted, the Maica is round and colored to match the ink. Having a colored pen body makes it easier to select the ink color you want, and who doesn’t need a little color added to their day? (Should I say “color” again?) Because of the “upgraded” body, I like holding and using the Maica model over the basic model. One point for the Maica. The hue of the transparent Maica cap also mirrors the ink color, and sports an embellished jewel-shaped “crown” on its end. 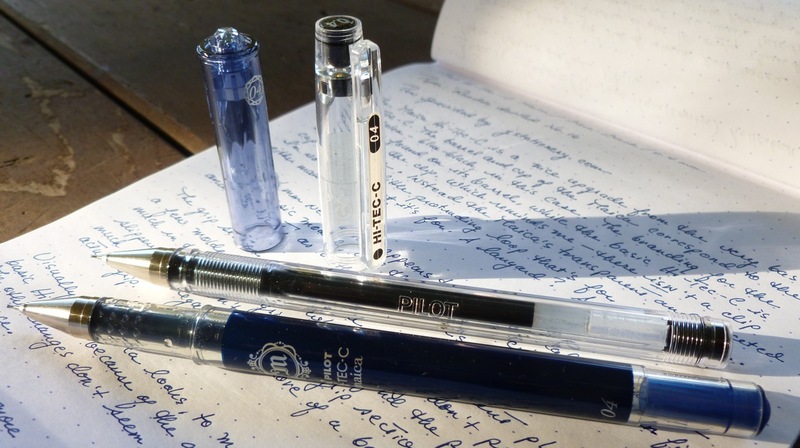 The basic cap is no-nonsense, and makes the pen brand and tip size very clear as that information is printed on the cap’s clip. The Maica cap doesn’t have a clip, but instead, sports a little plastic loop that’s for…ummm…what IS it for? A lanyard? Not sure. Truth be told, I’d prefer a clip over the molded loopy thing. One point for the basic. As far as the grips go, I’d call it a wash. Though they differ in design, neither is particularly grippy. I don’t have a problem holding onto either model, though, and really don’t have a preference either way. 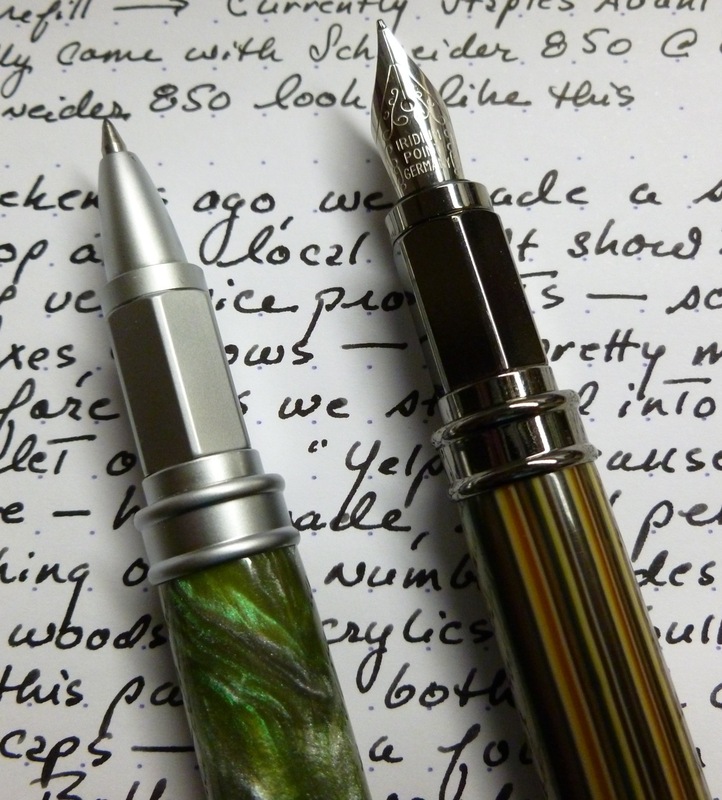 The writing tips (and refills) are identical. 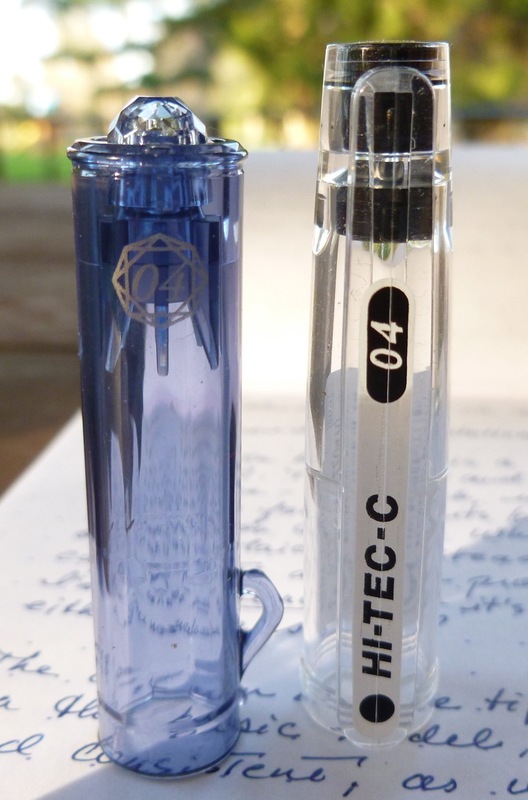 Both are needle-like and lay down the ultra-crisp line that is so well loved by Hi-Tec-C enthusiasts. So let’s give each model a point here. So what’s the score? Ah yes, two points apiece. Time for a tie-breaker, and that tie-breaker is PRICE! Surprisingly, the more substantial feeling, nicely colored and slightly embellished Maica costs a mere $2.25, whereas the basic Hi-Tec-C runs $0.55 MORE at $2.80. That may not sound like much, but if you buy all twelve Maica colors, that’s a savings of $6.60 (math whiz!). I can’t quite figure out why the upgraded model costs less than the stripped down version, but I’ll take it. So, folks, we have ourselves a winner. 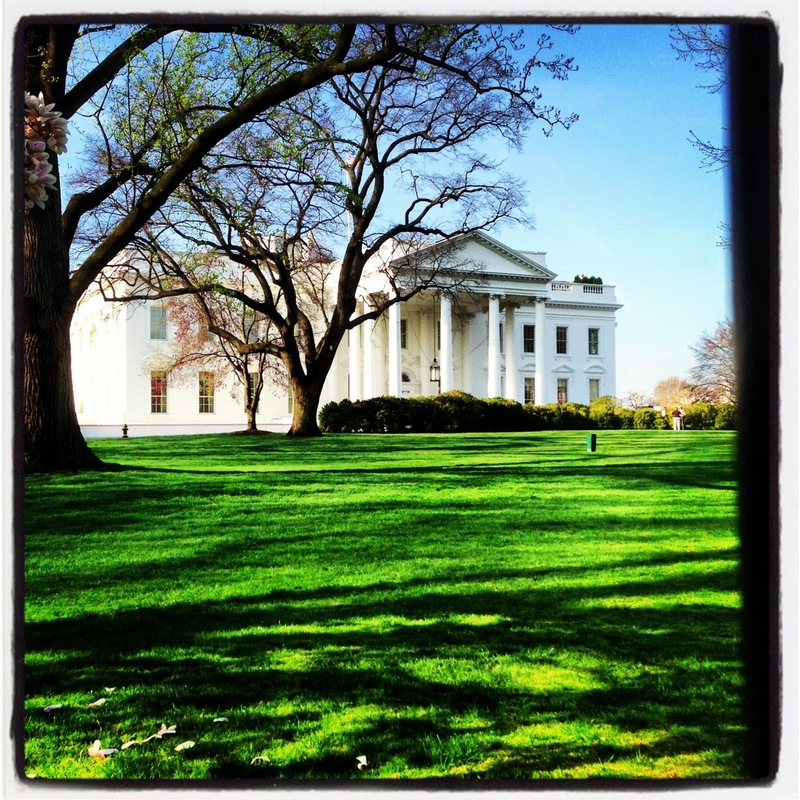 I spent a few hours in Washington, DC last Wednesday as part of a whirlwind bus trip. 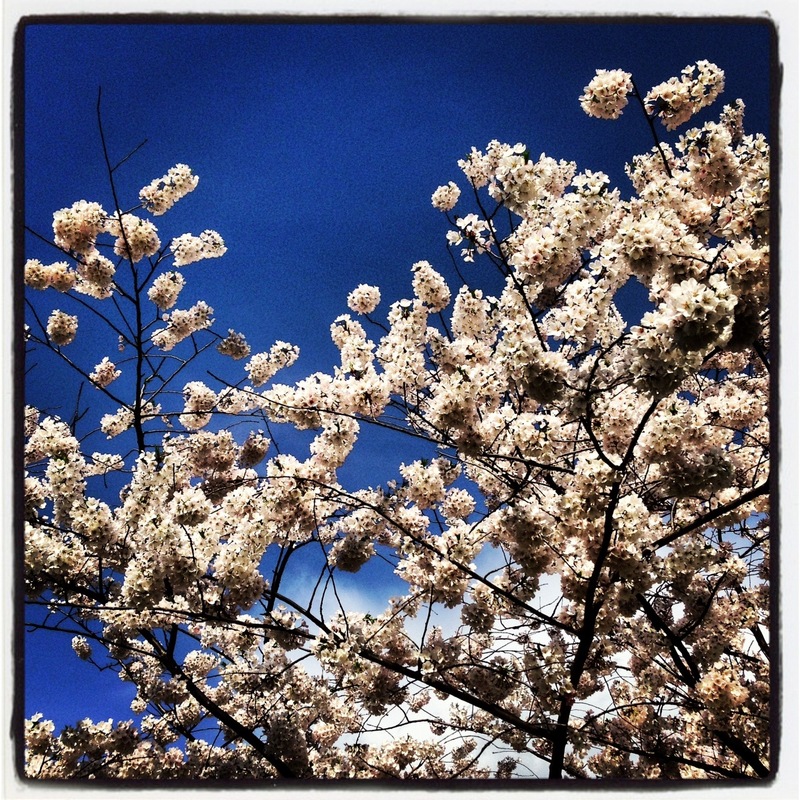 The weather was summer-like…very warm and sunny…which my snake belly white skin appreciated. 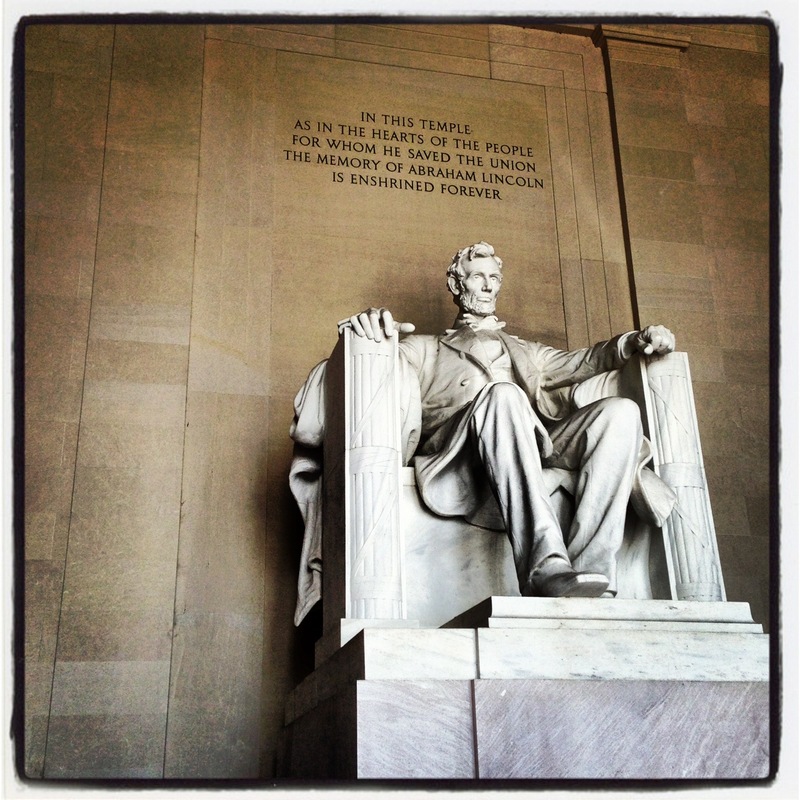 In those few hours, a small group of us raced from monument to monument, snapping pictures and drinking in the history. I was HOPING to find some sort of reference (monument, plaque, street name) to President James Monroe as I thoughtfully brought along my Retro 51 Vintage Metalsmith Monroe Tornado. I had a plan, you see. Monroe Retro 51 + Monroe landmark = Monroe blog post. But alas, there were no Monroe sightings. 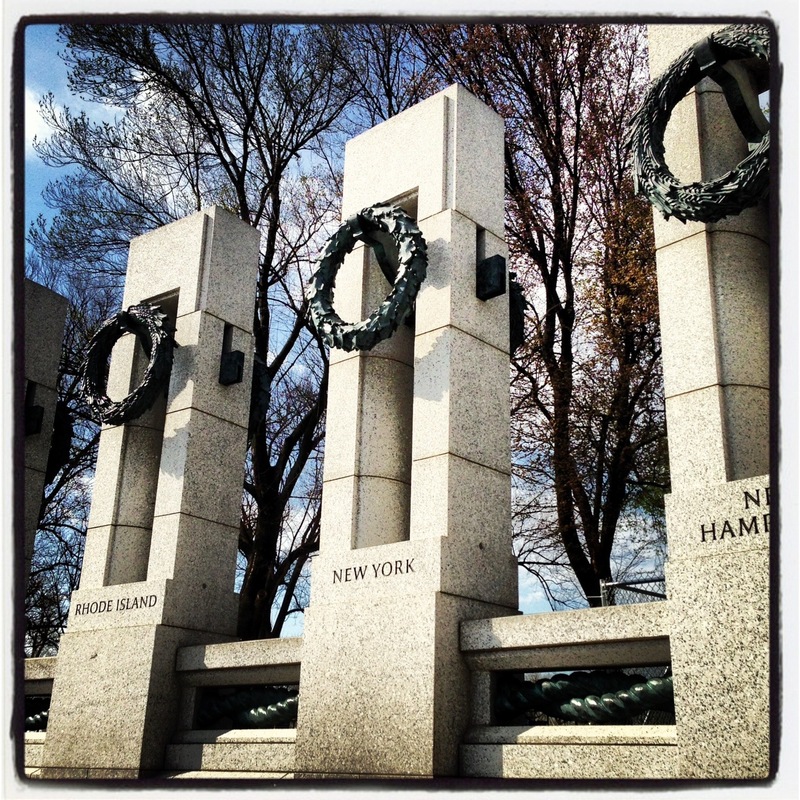 and the World War II Memorial. 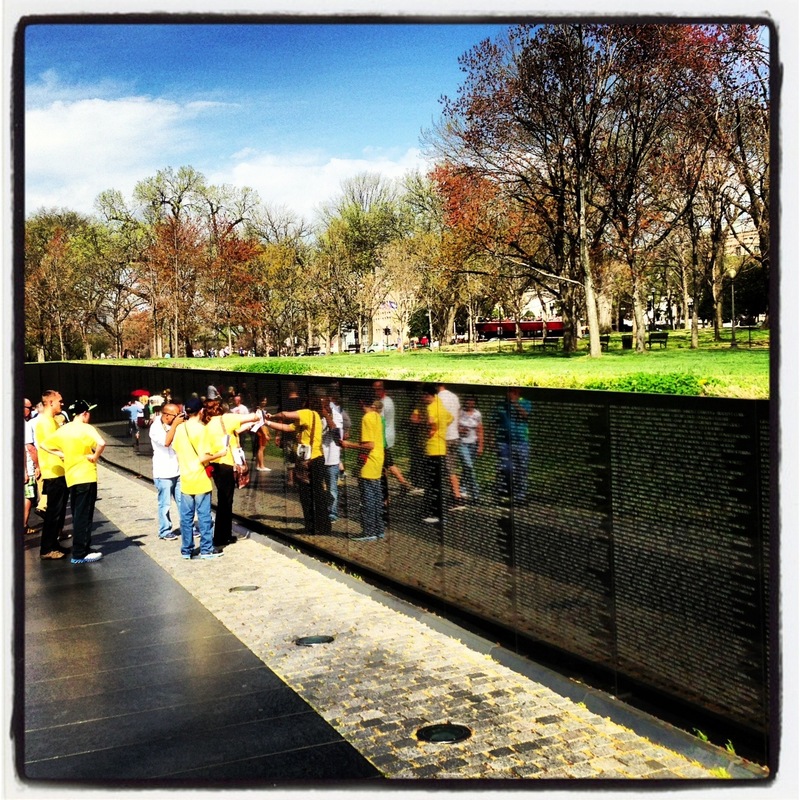 and visitors paid their respects at the Vietnam War Memorial. 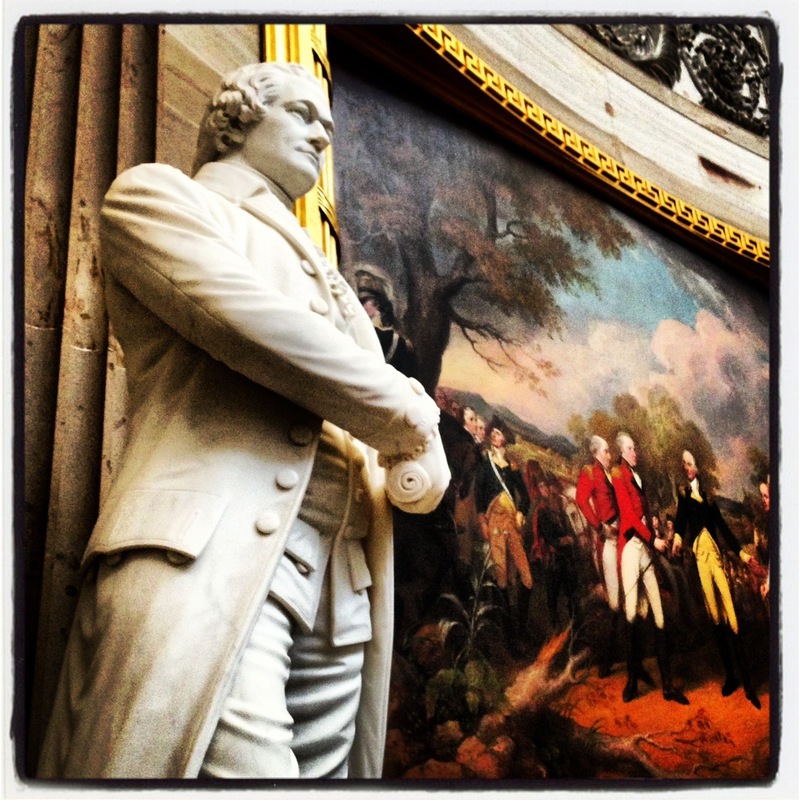 and made the acquaintance of Alexander Hamilton in the Capitol Rotunda. But as for Monroe? Well, he remained particularly elusive. 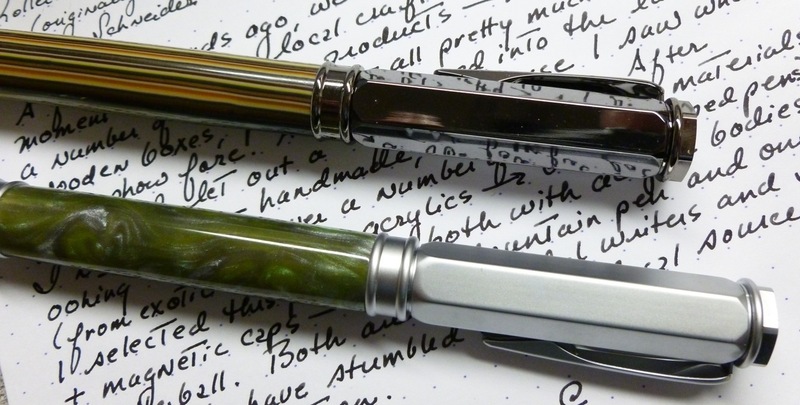 And while this lack of a “front and center” memorial could make a dead president feel slighted, the Monroe Tornado rollerball, by Retro 51, is better than some old hunk of marble. 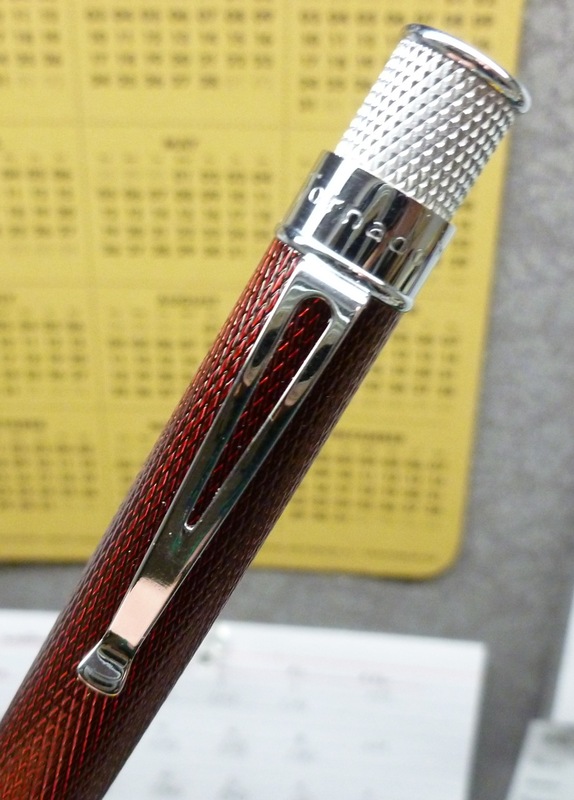 The body of the pen sports a finely cut diamond pattern in red lacquered metal, and the look is stunning. 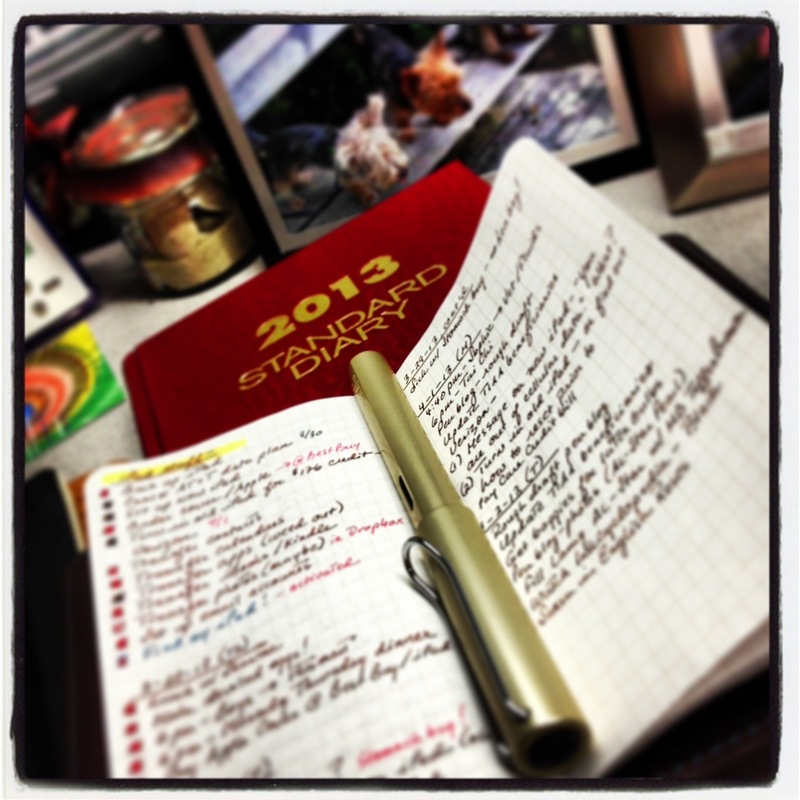 The finish is smooth, but slightly textured, and looks and feels a bit like glass. 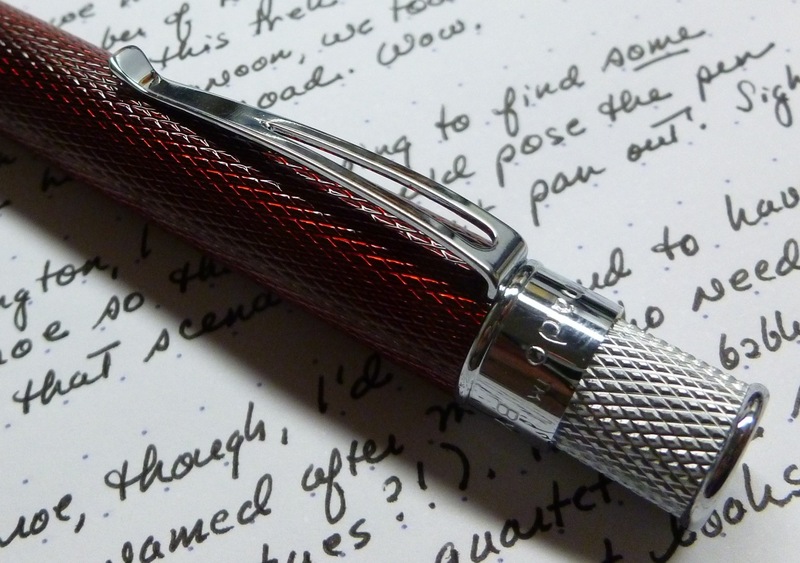 Light plays against deep red facets so that the pen shimmers and shines. I think it’s gorgeous. Gorgeous AND well made. As with the entire Retro 51 Tornado line, the Monroe is obviously solidly constructed and has a well-balanced, hefty feel in hand. The clip is springy and the knurling on the twist-action end mirrors the diamond cut of the body for a very cool look. 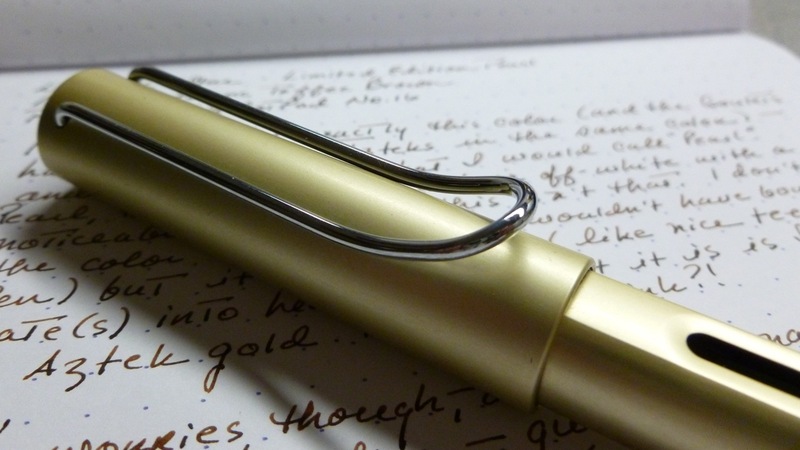 The level of detail in such a reasonably priced pen is impressive. The packaging is stellar, as is the writing performance, unless you require a super fine line. 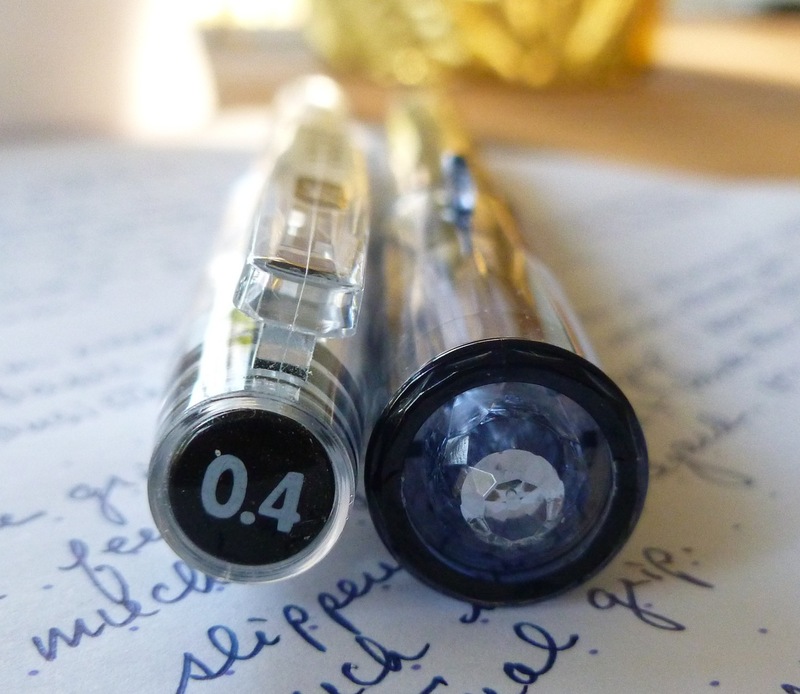 The Retro 51 rollerball refills lay down a 0.7 mm line so it’s a little broader than I usually like, but this pen is so good-looking that it’s become a non-issue for me. So, President Monroe, even though tourists in DC won’t find themselves tripping over monuments in your honor, the folks at Retro 51 have done you proud. And that is high honor, indeed. I had a Saturn sedan in this exact color (and the Goulets have TWO Pontiac Azteks in the same color). It’s not really what I would call “pearl.” Pearl, to me, is just a touch off-white with a distinctive shimmer or sheen, and this isn’t that. 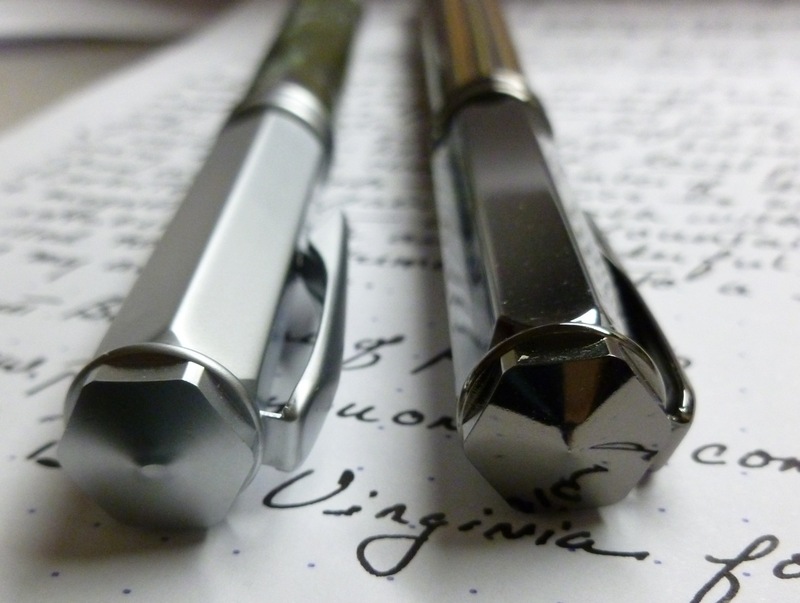 I don’t mind the color (obviously, since I bought the pen), but it isn’t “pearly” like nice teeth or the gate(s) leading to heaven. What it is is Saturn gold, or Aztek gold, don’t you think? 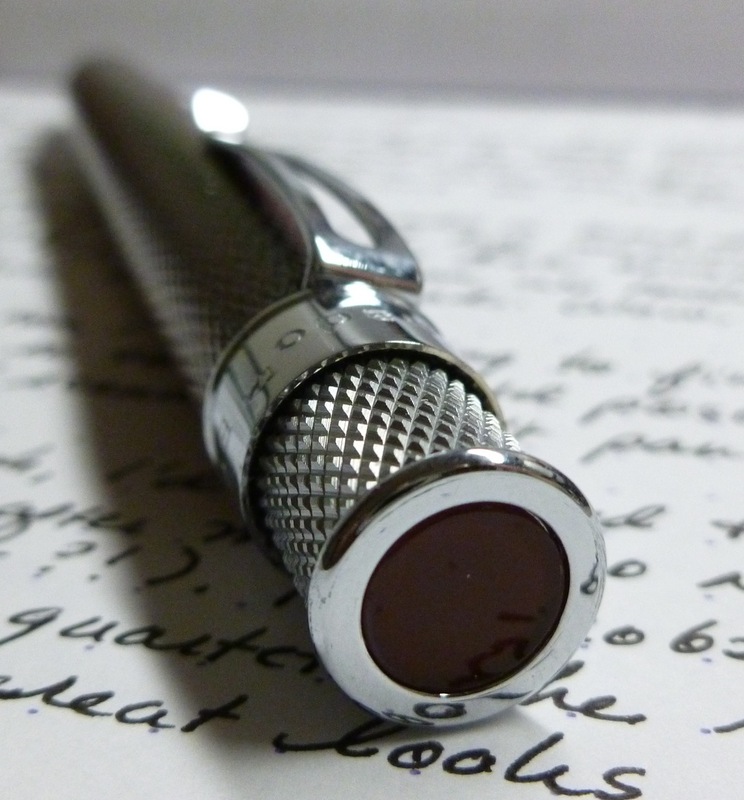 That Lamy Grip. Love it or hate it. Take it or leave it. The contoured grip area makes the Lamy AL-Star, Safari, and Vista a no-go for some because it tends to dictate how you hold your pen. 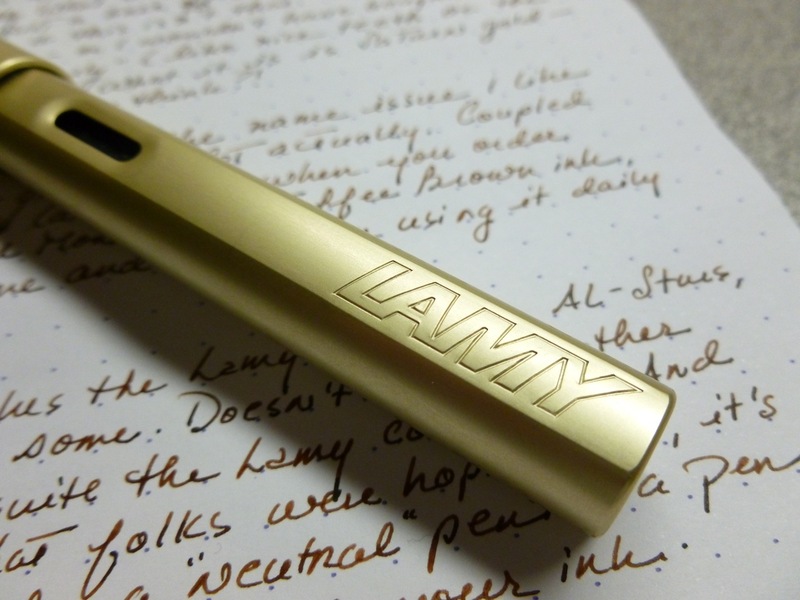 This doesn’t really bother me, so I’ve built up quite the Lamy collection without even really meaning to. (Hmmmm….mind control?) 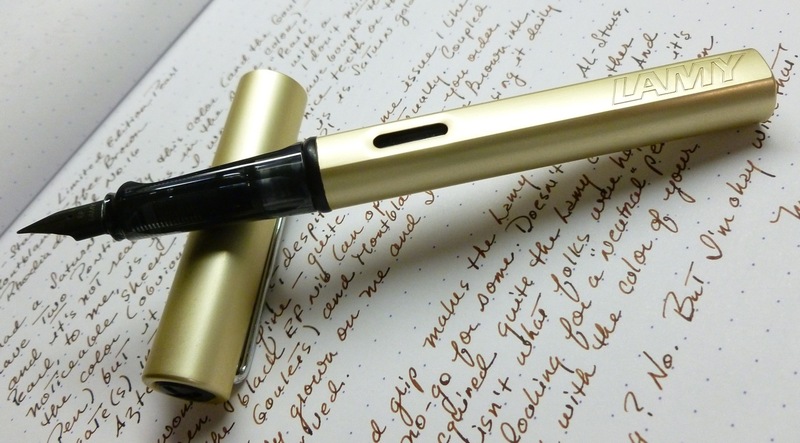 And while this 2013 color isn’t what a lot of folks were hoping for, it’s good for those looking for a “neutral” pen- one that doesn’t clash with the color of your ink. The aluminum body of the AL-Star sports the same branding, iconic clip, and porthole ink window as always. Why mess with design features that are immediately recognizable and function well. Pearl? No. Exciting? No. But I’m okay with that.